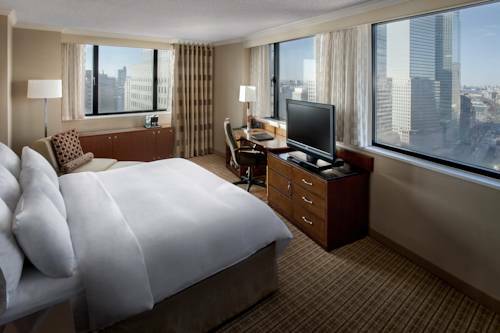 Reimagine your ordinary travel routine at New York Marriott Downtown. Situated in Lower Manhattan near Battery Park, our premier hotel is located near Wall Street, 9/11 Memorial and Museum and One World Observatory. Enjoy nearby shopping at Brookfield Place, Century 21 or the new Westfield World Trade Center. Business and leisure travelers alike will love spreading out in our spaciously modern accommodations, which strike the perfect balance between work and play. From day to night, guests can dine at Bill's Bar & Burger, our on-site restaurant serving New York-style flavors. With nearly 12,000 square feet of flexible space, our sophisticated event rooms are perfect for everything from intimate corporate meetings to lavish wedding ceremonies. During downtime, stay active and entertained in our state-of-the-art fitness center. No matter what brings you to town, book today and start planning your next adventure in Downtown New York! A top New York burger joint, Bill's Bar & Burger features freshly ground, hand-pressed burgers with loads of toppings, along with fries, shakes, salads, starters and some big plates for a delightful culinary experience in New York's Financial District. Enjoy the hearty and extensive menu of Bill's Bar & Burger in the secluded setting of Bill's West Side Bar. Our restaurant in Downtown New York City is available for dinner and private dining.